We are very happy to offer the latest and greatest product created by Multiradiance, the largest cold laser company in the industry. The MR4 LaserStim Cold Laser is like no other laser on the market. 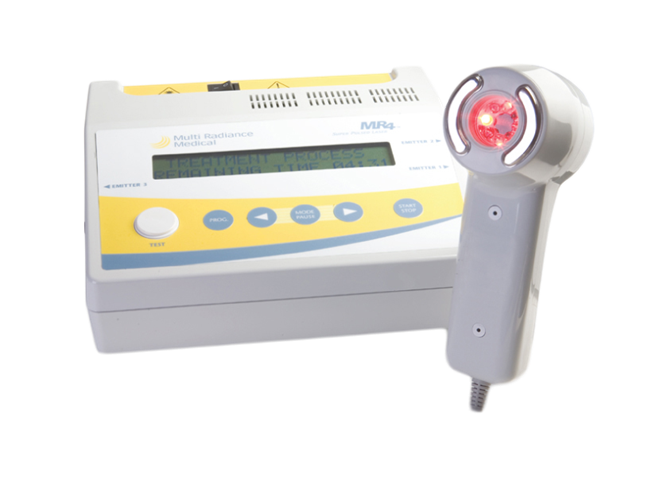 This laser is so unique because it has a diagnostic tool that helps locate damaged tissue using skin conductance, in addition providing cold laser therapy and electrical stimulation. During treatment, the LaserStim constantly measures the patient's tissue and alerts the operator to problem areas by changing the light on the emitter head from green to red. This feedback helps the operator find problem areas without the need for an X-ray or MRI. This tool saves practitioners the cost of other expensive diagnostic equipment making this system one the best Returns-On-Investment (ROI). Treating deep tissue damage has never been easier. This patented technology, called TARGET (Treatment Area Recognition and Guidance Enhanced Technology), gives practices a look inside their patients body. No other cold laser sold includes this kind of diagnostic tool. Industry leading 3-year warranty included in the price. This product can be sold to professional only. MR4 LaserStim with Magna Cart, Extended 3-year warranty, Extended Protocol Library and Free shipping Stock? By combining electrical stimulation, or "e-stim", and cold laser technologies into one device, practitioners can treat their patients with the healing benefits of cold lasers while maximizing their reimbursement from most insurance companies. This system allow professionals to get a premium rate for every therapy since the therapy can be billed as the CPT codes of 97026 (infrared therapy) and 97032 (electrical stimulation). This can accelerating the payback of your cold laser while providing your patients with the highest level of care. A must-have for any practice, the LaserStim combination is an FDA approved cold laser with an electrical stimulation emitter that allow for 2 medical insurance reimbursements. By combing these two treatment modalities with a diagnostic tool, practitioners have one of the most powerful and flexible treatment tools available. With this system, practitioners have the the highest probability of helping patients with a wide variety of conditions. This system is also available for home use. The new Laser-Stim accessory is the first of its kind, a hybrid probe that provides both light therapy and electrical stimulation. The FDA approved Laser-Stim combination probe can provide simultaneous or independent light as well as electrical stimulation for superior clinical applications and outcomes. Based on the SE25 emitter, the single super pulsed diode produces 25,000 mW of peak power as well as incorporating Red LEDs, Infrared emitting diodes and the static magnetic field. The MR4 console comes equipped with three emitter ports, which gives you the ability to upgrade your laser to a dual emitter system in addition to the LaserStim, when you see fit. 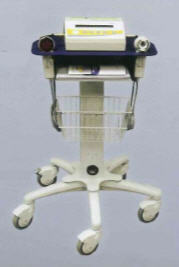 Please note: Up to 3 emitters can be used simultaneously to cut treatment times in half or more for optimal efficiency. UPS 3 day express shipping to anywhere in the US is free (including Alaska and Hawaii). Because the LaserStim combines cold laser technology with electrical stimulation therapy, it qualifies for most insurance reimbursements programs (where electrical stimulation is qualified). The Medicare reimbursement code is 97032. This gives your patients the opportunity to get laser therapy at a discounted price. The average reimbursement for electrical stimulation therapy is 10 to 20 dollars. * The product is classified as a TENS unit but it uses Neuro-Adaptive technology to stimulate the area at the neuron level and not at the muscular level like standard low-cost TENS, IF and Micro-current devices. The MR4 controller has 3 total outputs so this system can also drive 2 additional (optional) emitters. The MR4 LaserStim is the ultimate cold laser. In addition to being FDA cleared, this design can turn a beginning practitioner into a pro b y guiding the emitter to the damaged area and indicating how long the area needs treatment. The super-pulsed laser technology allows this laser system to be sold without a prescription and there are no licensing restriction, making it the most powerful and flexible system on the market.